"To this day the name Mary Celeste continues to haunt everyone who sails upon the sea." 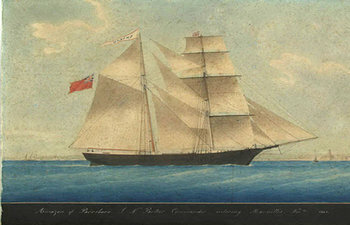 A painting of the Amazon (later renamed Mary Celeste) by an unknown artist. The beautiful Mary Celeste ship was found floating aimlessly in the Atlantic Ocean in the month of December in the year of 1872. When the ship was discovered, everything appeared to be in order – despite the fact that the Captain and his crew were not found. The cargo appeared to be untouched. The ship showed no visible signs of distress. As a matter of fact, the only thing that appeared to be in disarray was a sail that was a bit tattered. The large cargo ship floated across the Atlantic Ocean now a ghost ship. However, no explanation on the state of the Mary Celeste was ever concluded. Here, you will learn about one of the greatest unsolved mysteries of the world – The Mary Celeste mystery that still plagues the minds of men to this day. There are many theories on what happened to result in the Mary Celeste becoming abandoned. Many individuals felt as if pirates were to blame as they were common criminals among the high seas during the time period that the abandoned ship was found. Many individuals believed that perhaps a strange sea monster was to blame for the missing Captain and his crew. Many believed that the Mary Celeste mystery was a result of a run in with an alternate universe or perhaps caused by a voodoo based curse. However, these were just theories – none of which could be validated in any way whatsoever. In truth, there were only two true threats that the brigantine merchant ship faced that were realistic. The first threat was the cargo that was loaded on the ship. When the ship was discovered, many barrels of industrial alcohol were located on the ship. The cargo was considered to be volatile based on the fact that it was highly flammable and contained in ship that was composed solely of wood. The second real threat that the merchant ship was exposed to was possible seismic activity that was known to occur on the floor of the ocean that the ship traveled over. Is it possible that the Mary Celeste was subjected to seismic activity? This still remains to be one of the greatest unsolved mysteries as far as maritime history is concerned. On the 5th day of December in the year of 1872, a cargo ship named the Dei Gratia was on a long journey across the Atlantic Ocean. The Captain’s name on this ship was David Morehouse. He was carrying a load of petroleum that had to be delivered. At approximately 1300 hours, the Captain identified a ship sailing on ocean that appeared to lack control of any means. Little did he and his crew know that this particular discovery would be one that they would consistently regret for many years to come. Upon further inspection, he discovered that the ship did not have anyone at the wheel, and the sails were not set appropriately. The Captain and his first mate elected to climb onboard a small water boat that was attached to the Dei Gratia and set sail towards the Mary Celeste in order to determine if there was anyone on board and to determine if they could figure out why the ship seemed to be traveling aimlessly. They both knew that if the ship was truly abandoned, they could take it to land and make quite a bit of money from the salvage of the water vessel. They determined that the water vessel was relatively new. There was just a bit of weather damage. Upon researching the ship, he determined that the cargo was untouched, and the ship was in good condition on the most part. As the Captain investigated the ship, he made some unusual discoveries. First, he found a rope trailing behind the ship in the water. Upon further inspection, he discovered that there was no lifeboat attached to the Mary Celeste. When the Captain inspected the room that was below deck, he found that the instruments to the water vessel were abandoned. He found the log book, the slates that were used for logging, as well as the charts that the Captain used. He also discovered all of the belongings to those that had been on the ship. As he looked around, it did not appear that there was any type of attack or other type of damage. However, he did find a bit of disorder in the room. He saw that papers were tossed about and it appeared that an iron stove was moved from its original location. He discovered, based on the remains left behind, that the Captain, his wife, their two year old daughter, and a crew of seven men had simply disappeared from the Mary Celeste. During the 1800s, it was not too unusual for a ship to be found abandoned. As a matter of fact, many ships were during that time. This is why salvaging was such a popular activity among ship Captains. The Captain of the Dei Gratia brought the water vessel to land, expecting to receive a large sum of money for his find. Unfortunately, this is not what happened. The case of the Mary Celeste mystery was taken to court in an effort to find that Captain Morehouse was responsible for foul play and directly responsible for the disappearance of the ten people that were onboard the merchant ship that he had discovered floating adrift the desolate Atlantic Ocean. It was determined that the Mary Celeste was one of the many merchant ships that often sailed from the New York harbor. The Captain, Benjamin Briggs, had made a full life investment into the ship. This investment only covered a third share of the water vessel. Before the water vessel left the New York Harbor, the Captain elected to take along his wife, Sarah, as well as their two year old daughter, Sophie. He also had a son, but decided that he should stay behind with a relative in order to pursue his education. His son was seven years old and his name was Arthur. Upon investigation, it was established that the family was a religious one that thoroughly enjoyed hard work from the New England area. They were not known to drink or engage in other types of behavior that was against the church. As a matter of fact, they were in the church at every opportunity. They were a well liked family and considered to be close knit. However, it was at this time that the family would be nearing a mysterious fate. It was established that the voyage of the ship started on the 5th day of November in the year of 1872. Unfortunately, the ship did not make it very far. Sarah Briggs created a letter to her mother in law and expressed the fact that torrential weather caused them to set anchor just a mile from the harbor. It has been established that this was the last letter she composed and that the water vessel was able to set sail by the 7th day of November. The crew met many challenges, but the last entry of the log showed that the vessel was located just six miles near the Santa Maria Island. It is at this time that the Mary Celeste mystery truly starts. 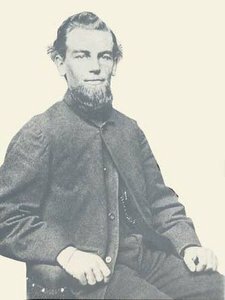 Frederick Solly-Flood did not believe that the Captain and his crew discovered the Mary Celeste as they described for the salvage. He pursued the case in court. This was the Attorney General of the region where the water vessel was taken after being found called Gibraltar. He made every attempt to prove that this was not a missing persons case, but a case of murder. After many different attempts to prove that the crew, Captain Briggs and his family were murdered, the case was dismissed and the crew was found innocent, though Flood still suspected foul play. The ten souls that were missing from the Mary Celeste continue to be lost…Eventually; the Mary Celeste sank, perhaps taking down with her the story of the missing souls and perhaps one of the greatest unsolved mysteries of maritime history to date.